The ICOM IC-A14 transceiver was designed with the noise associated with flying. This unit utilizes an amplifier to boost the audio output of the internal speaker above surrounding noise levels. Lightweight and compact with a full keypad, the ICOM A14 is pilot friendly and goes anywhere easily. Just put it in your pocket and go! Large capacity batteries accommodate a full 18 hours of operation. Up to 200 memory channels can be named with 8 character labels and stored into any of 10 memory banks. 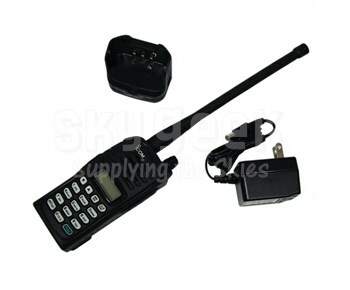 Other features of the IC-A14 Air Band Radio include a backlit LCD display for night use, ANL noise reduction, low battery alert (beep), adjustable microphone settings and a BNC type antenna connector. The IC-A14 includes all of the standard accessories plus a mountable charging cradle. Note: Please use the Volt AC map below to determine which charger type will work in your location. Then with the options drop down near the add to cart button please select the correct charger type needed. Still have questions about plug types? Click here to get them answered at Wikipedia.